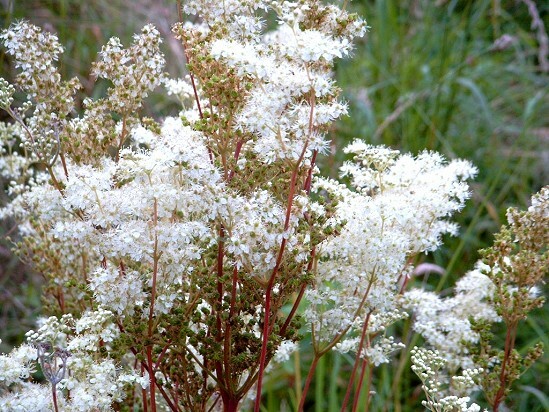 Meadowsweet is common in damp woods and meadows, in fens and by riversides throughout Europe, including the British Isles. 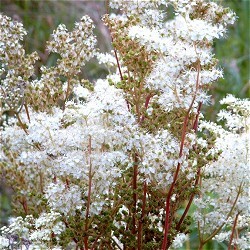 It has fernlike foliage and tufts of delicate, graceful, creamy-white flowers, which are in blossom from June to almost September. The leaves are dark green on the upper side and whitish and downy underneath which pinnate, with 5-11 fine-toothed leaflets. The flowers are small, clustered close together in irregularly-branched inflorescence, and have a very strong, sweet smell. The whole herb possesses a pleasant taste and flavour, the green parts partaking of the aromatic character of the flowers. It has been used as a medicinal plant since ancient times and it remains popular as a herbal remedy.